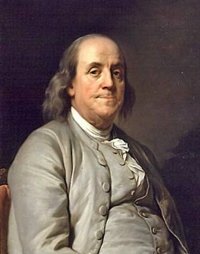 On this day in history, November 20, 1728, a 21 year old Ben Franklin published "Articles of Belief and Acts of Religion," a statement of his religious beliefs as a young man. He does not go so far as to accept Christ's deity, but does generally adhere to the Christian concept of God. Later in life, his views became even more orthodox and in agreement with mainline Christianity, though he never did claim assurance that Christ was divine. In "Articles of Belief and Acts of Religion," young Franklin begins by concluding that he is inconsequential in the scope of the universe and that God must be above being concerned with whether or not he is worshiped by such a puny being. He does, however, conclude that God must appreciate and enjoy being worshiped by His creation, because He must have emotions like we do, or else He would not have put them into us. Franklin concludes also that it his duty to worship God, since He is all powerful and since he owes his existence to Him. He also concludes that God wants human beings to be happy and takes pleasure in their virtue and happiness. He ends with his own system of daily adoration, petitions and self-reflections for approaching God. A quote from the work: "I love him therefore for his Goodness and I adore him for his Wisdom. Let me then not fail to praise my God continually, for it is his Due, and it is all I can return for his many Favours and great Goodness to me; and let me resolve to be virtuous, that I may be happy, that I may please Him, who is delighted to see me happy. Amen."